What's Mummy Up To ...: A sewing Mummy's Dream-Come-True ... And some pretty dresses too! A sewing Mummy's Dream-Come-True ... And some pretty dresses too! OK, so the dress might have needed a little more Mummy-input than the other two projects (like I did all the overlocking and arranged the pattern pieces for her to cut around), but she totally did all the sewing herself. I even stood back from the sewing table and watched for parts of the process ... clever girl! And what is this dress I hear you asking?? .... Well, if you follow me on Facebook, you will have noticed that every now and then I'm posting about a cute online pattern or idea I see. 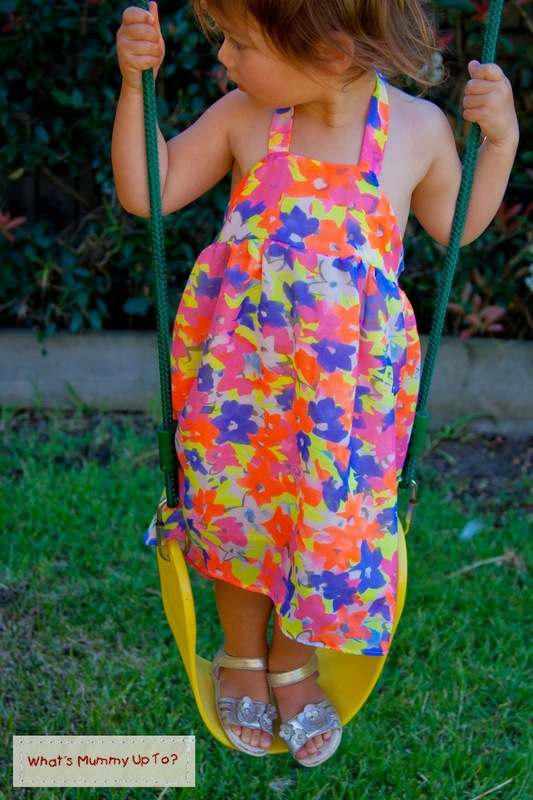 This little dress is the Cupcake Dress from Baste + Gather. It has a free pattern as well as the tutorial ... who doesn't love a free pattern, huh! It was a very easy sew, and I would highly recommend it. In fact, so as to ensure Bethany was not the only one having all the sewing fun, I also made one up for Hannah. Now for this dress, I actually used a skirt that I made for Bethany (which was a bit of a design fail and didn't fit properly) for the skirt section, and joined it to the Cupcake Dress bodice. For that reason the skirt is not quite as full in Hannah's version. Still cute though, huh! 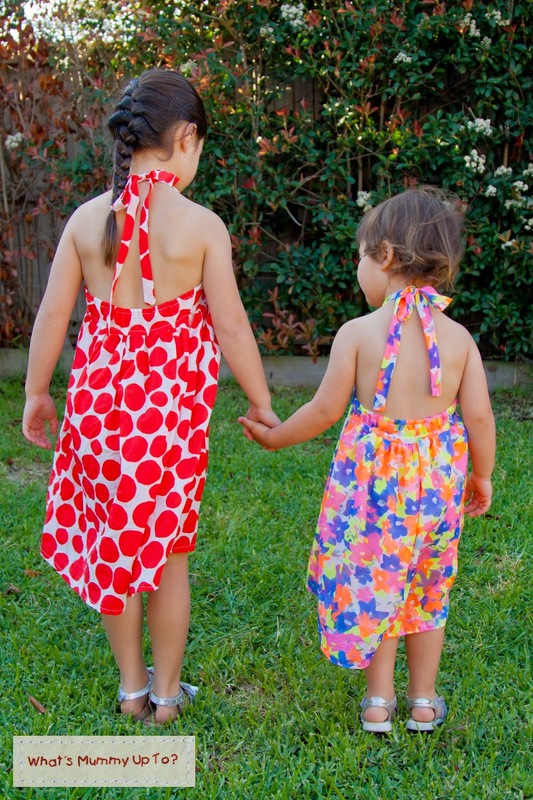 The only change I would make if sewing up this pattern again, is that I would shorten the elastic by about an inch or maybe two, as the back of the dress is a little loose on both of my girls, and therefore hangs pretty low on their back. Having said that, both my girls are fairly petite, so maybe it's only a problem for some. 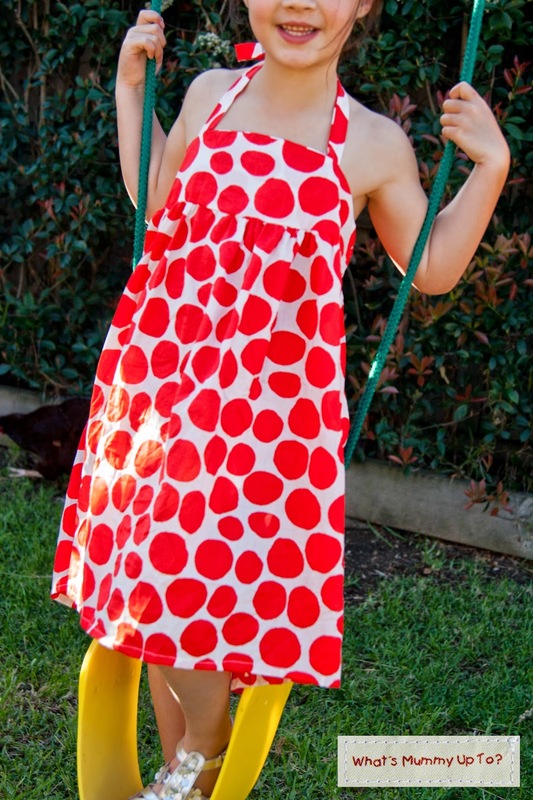 I do love the halter-neck style though, and Bethany LOVES the "flowiness" of this dress. Perfect for the recent summer-esque weather we've been having, and really cute with a cardigan thrown over it for the slightly cooler evenings too. Oh, and do you know Mummy's Mummy (aka Nanna) has also made a few of these little dresses ... yep, in Christmas fabrics ... how organised is she!?! So, Christmas outfits .... sorted! !